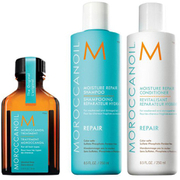 Treat damaged hair to the benefits of Moroccanoil's Mending Fusion; a luxurious treatment that works to nourish and condition locks, especially dry ends. Infused with Hydrolysed Quinoa, Argan Oil and Baobab Extract, the antioxidant-rich formula enhances softness and shine, whilst defending against split ends, brittleness and breakage. 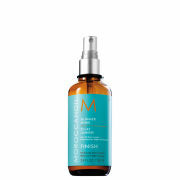 Tames frizz and promotes a smooth, sleek finish without greasy residue. Apply 1-2 pumps between palms and work through dry hair, focusing on the ends after styling. Reapply as needed. Water, Dimethicone, Glycerin, Cyclohexasiloxane, Hydroxyethyl Acrylate/Sodium Acryloyldimethyl Taurate Copolymer, Squalane, Argania Spinosa (Argan) Kernel Oil, Hydrolyzed Quinoa, Hydrolyzed Adansonia Digitata Seed Extract, Camellia Sinensis (Green Tea) Leaf Extract, Chamomilla Recutita (Matricaria) Flower Extract, Lavandula Angustifolia (Lavender) Flower Extract, Parfum/Fragrance, Coconut Alkanes, Peg-40 Castor Oil, Galactoarabinan, Polysorbate 60, Dilinoleic Acid/Propanediol Copolymer, Sorbitan Isostearate, Benzophenone-4, Panthenol, Coco-Caprylate/Caprate, Xylitol, Ethyl Macadamiate, Citric Acid, Benzophenone-3, Tocopherol, Malic Acid, Sulfuric Acid, Potassium Sorbate, Sodium Benzoate, Benzyl Alcohol, Phenoxyethanol.